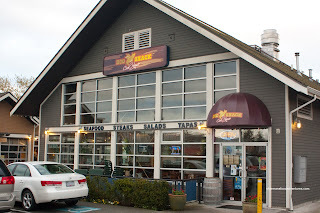 Okay, it is no secret that I've been doing quite a few revisits to restaurants which I haven't been to in awhile. If there has been any significant changes, I end up putting up a new post while taking the old one down. However, some are merely an add-on to an existing post. This time around, I couldn't do either. You see, I've just recently been to the Hog Shack, so nothing has really changed all that much. Secondly, I really couldn't add onto the existing post since this was almost like a repeat of sorts with a whole bunch of new items. Somehow, it just seemed like a good idea to do a separate post. The actual reason I was bac k was due to Mijune's "birthday" event at the Hog Shack and subsequent dessert-a-thon at The Apron afterwards. The deal here was we pay one flat fee and we would be presented an array of food to share amongst our tables. Miss Y ended up joining me since she and Mijune seemed to hit it off ever since they met. We were joined by Anita and her friend to complete our table of 4. Apparently, we are nearly at the bottom of the friend totem pole since we got our food last at the same time as another lowly table of bottom-feeder friends. Now I know where I stand with Mijune! So with practically every table finished eating while we were just starting, you can imagine the barbaric eating display we put on. Well, it is food meant to be eaten with our hands right? So I'll start with the sides. Last time, I had concluded that the sides were probably the weakest part of the meal. So we'll see how they fared this time. 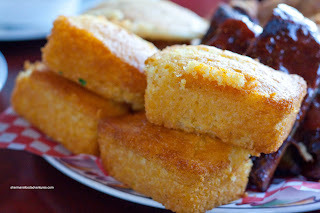 The Corn Bread, served as mini-loaves were pretty much the same being crumbly and moist. It wasn't too sweet which is something I personally like. I would've liked more crunch from more cornmeal though. 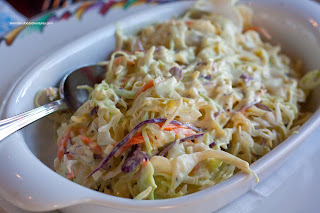 The Coleslaw was crunchy and had a decent amount of zing. It was creamy from the liberal use of mayo. Overall, an okay coleslaw. 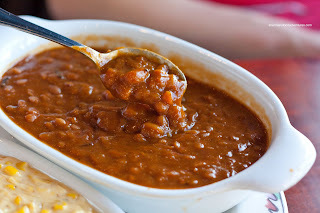 The same could be said about the Baked Beans. Much like last time, the beans were rich and slightly smoky. Naturally, it is plenty sweet due to the molasses. 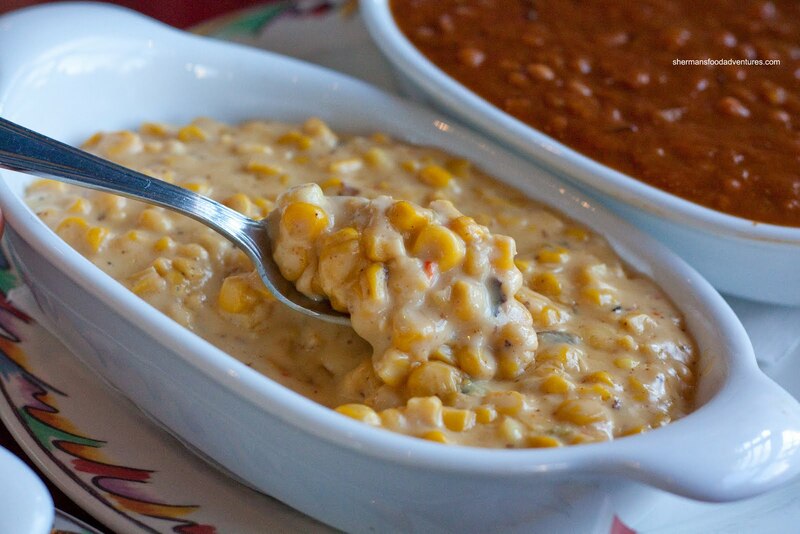 Now, saving the best for last, the Creamed Corn was the table favourite. We had none left at the end. The corn niblets were sweet and crunchy. 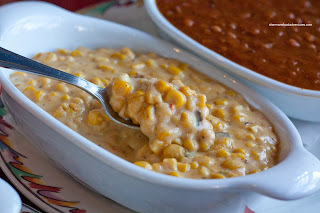 They were bathed in a creamy sauce that was also sweet; but complimented the corn at the same time. Loved the consistency of it. Moving onto the main event, we were presented a platter consisting of things not easily found in the GVRD. First, we have the Pulled Pork Pancakes. I know that the Red Wagon has them and Deacon's Corner does a version as well. Other than that, I personally do not know many places that have it on their regular menu. Starting with the pancakes, they were soft, fluffy and only slightly sweet. Sandwiched in between was a good amount of tender pulled pork slathered in just enough BBQ sauce. Just like last time, I found the sauce to be not as "deep" or smoky as I would've liked. It is more sweet and "zesty" (if that is the right word) than anything. 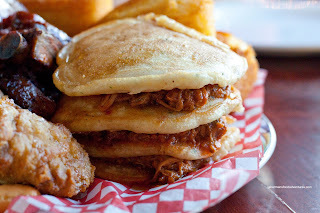 I like the combination of pancakes and puled pork. For me, I think this is just as good as the one from the Red Wagon. It surely is bigger with one more layer. Another rare item on the platter was the Chicken and Waffles. Now this is not usually found up here in Vancouver. 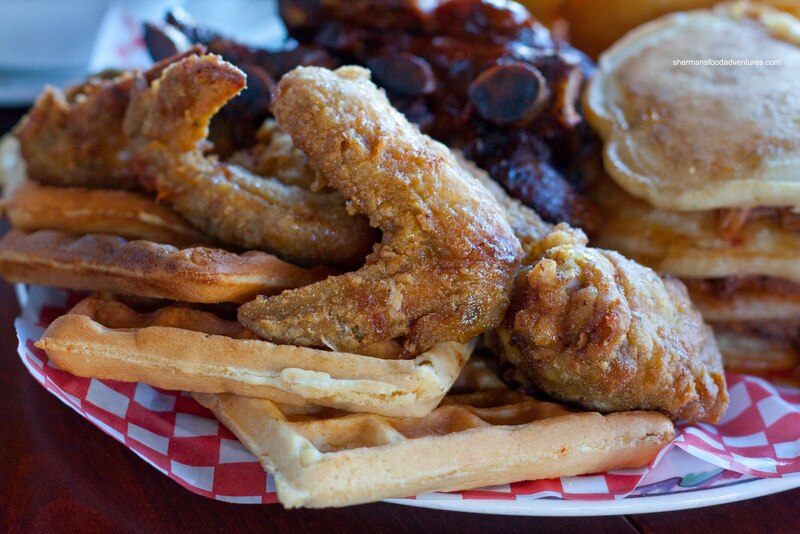 Some may not understand the combination; but just google Roscoe's and you'll get the idea. Another winner in my books. For me, it was all about the fried chicken. Each piece was crispy and well-seasoned. Yet, the most im portant thing of all was that the chicken itself was moist and juicy - each and every piece. Combined with the sweet waffles, it was a nice contrast. The only thing I would've liked to see was a crispier waffle. The St. Louis Style Ribs that were on the platter were appreciably more moist and juicy this time around. Coincidence? Not sure. But I did noticed that the rack of ribs were more meaty and thick which could've helped keep the moisture in. I've saved the best of last because I can't get enough of the Burnt Ends. These consist of slow smoked br isket which is cut up, sauced and put back into the smoker for another go around. 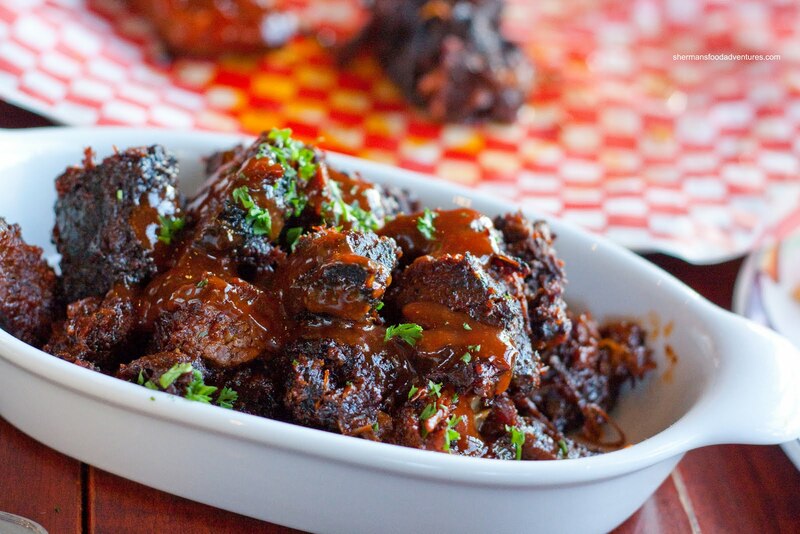 The result is a very smoky, flavourful chunk of meat. The flavour burst will knock your socks off. This is a must try here. Once again, this is not a typical item found anywhere else in Vancouver. And this can be the theme of the revisit - foods that you can't find readily anywhere else. Unique items to our part of the world is what makes the Hog Shack special.